A couple years ago, during a lull at November Meeting, the then-bishop of Wilmington sidled up to a reporter to ask what was doing. Told that his retirement had become a hot topic, Michael Saltarelli smiled -- no one was waiting on it more than he... not to shirk an iota of duty or anything, but just so, the burdens of administering a two-state, 200,000-member church behind him, he could return again to his greatest love: being a simple priest. 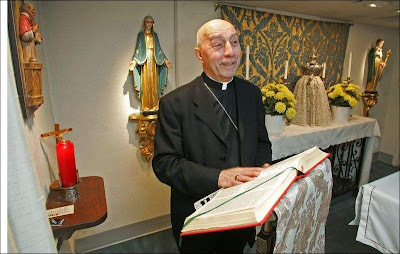 Asked along the way whether he'd be staying in Delaware or heading home to North Jersey, the privately chatty, publicly austere prelate who answered to "Mickey" said he'd be keeping on in Wilmington, where he was sent in 1996, adding that he'd been going a bit more frequently to pray the Rosary at the tombs of his predecessors, where he already had his place "all picked out." "Hey, I'm gonna need 'em one day, too," he said of the remembrance... and sad to say, it seems the day's come. A year after his retirement became reality, two months after his cherished "son" got a diocese of his own, word from Wilmington says the "good bishop that only ever wanted to be a priest" is nearing the other side, and the locals have written to beg prayers. So please join in -- not just for dear Mick, but all the untold sick, suffering and heartbroken who, at this hour, could use a special place in our hearts.